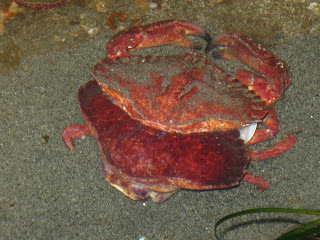 This weekend the Marine Exhibit was busy as the Thanksgiving crowds came to visit our animals. Although some of the tanks were empty, there was still plenty of entertainment. The octopuses were out and showing off, crabs were stealing food from sea stars and the first two grunt sculpin eggs hatched. 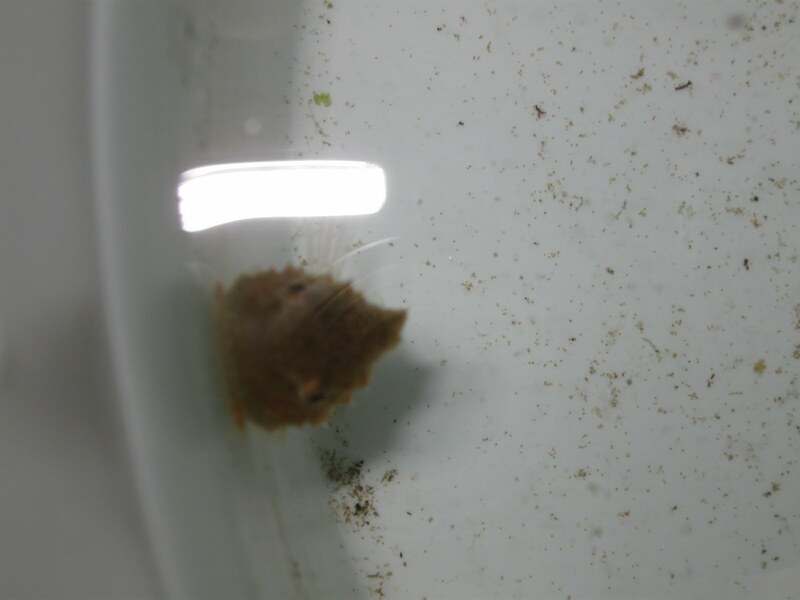 Grunt Sculpins (Rhamphocottus richardsonii) are squat little fish with a long snout and spiny fins. 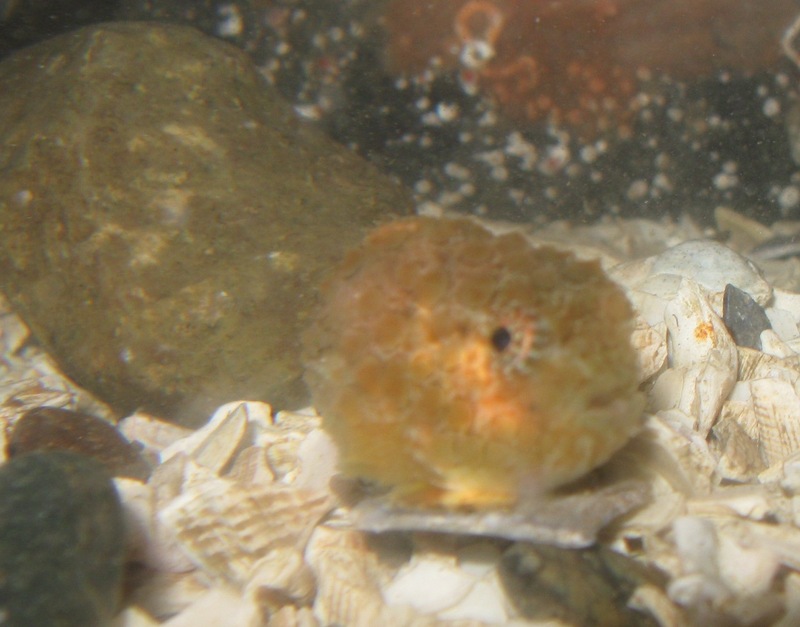 They are called grunt sculpins because they actually grunt when taken out of the water! Grunt sculpins range from the Gulf of Alaska to Santa Monica Bay, California and are found in tidepools and shallow water. 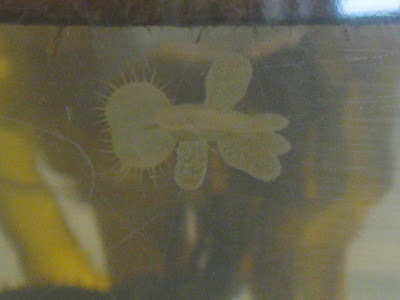 They only grow to be about 8.3 cm (3.3 in) long. 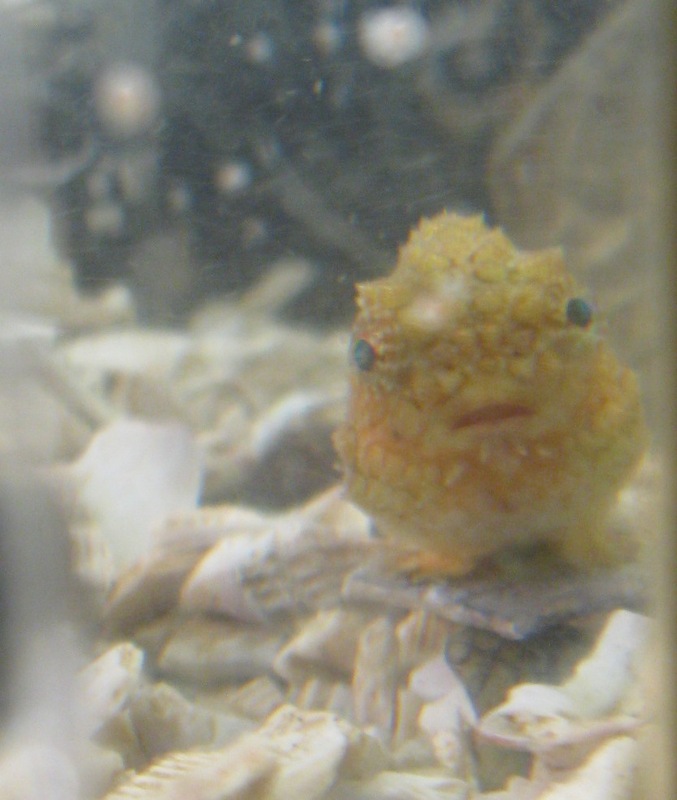 They aren't good swimmers so they use their pectoral fins to crawl around on rocks and the sea floor. 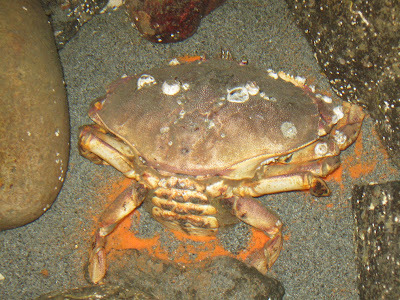 They like to hide in giant barnacle shells and the females will trap a male in a barnacle shell until he fertilizes her eggs. 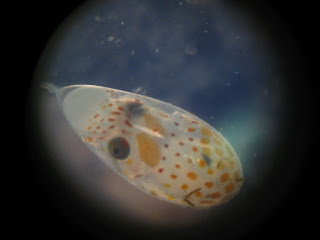 Unfortunately, not much is known about the life cycle or behavior of the adorable little fish. What are their predators? Does the male or female guard the eggs? What is their population size? Maybe someday I'll study them and become the definitive expert on grunt sculpins. You can come see these cute fish and all our other animals December 26th and 27th and January 2nd and 3rd. 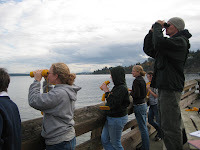 During Wednesday's satellite meeting we had a pleasant interruption; orcas were once again spotted off the pier here at the marine science center. Last time they came through I missed them and seeing them out there reminded me how fortunate I am to be working on such an important and exciting project. 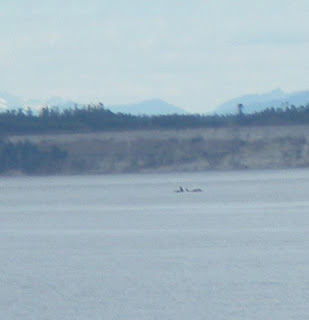 Although they were off in the distance towards Whidbey Island we were able to see them clearly with the binoculars- several dorsal fins, a few breaches and even a spy-hop. 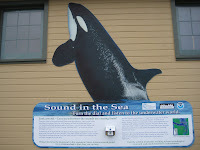 While we observed we were able to listen to them vocalize on our hydrophone (underwater microphone) here at the center. If you are out on the pier go behind the center and listen to what is happening live. You can also listen live online at http://www.orcasound.net/. 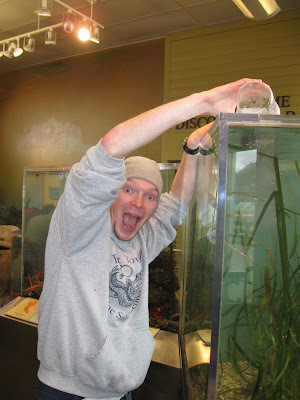 Scroll down the page and click on Listen to Port Townsend Marine Science Center. Vocalizations from Wednesday should be posted soon, but you can listen to prior recordings right now! 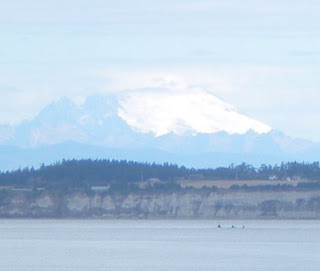 Currently several organizations, Orca Network, the Whale Museum, Beam Reach, SMRU Ltd. and our very own Port Townsend Marine Science Center are assisting in a project tracking the travels made by the Southern Resident killer whales in Admiralty Inlet. 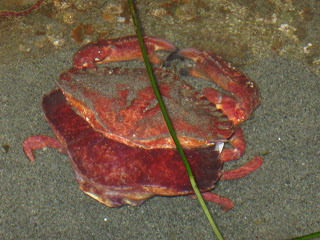 Hydrophones are being used to record vocalizations made at different depths in the Inlet. This information assists researchers in understanding the depths orcas dive. 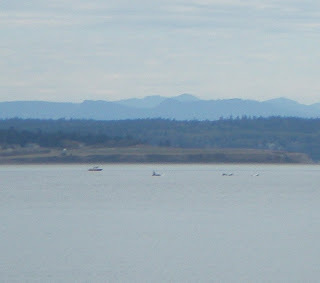 Snohomish Public Utility District will reference data collected in this study while making decisions on a potential plan to build underwater turbines in the Inlet. These turbines would use tidal currents to produce energy for use throughout the Puget Sound. 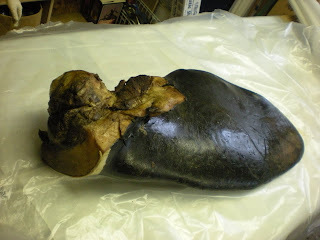 For more information on PUD's project check out their website http://www.snopud.com/powersupply/tidal.ashx?p=1155. Seeing killer whales in the wild is such an amazing experience! The project above needs your help reporting sightings. If you are lucky enough to spot orcas please immediately call 1-866-ORCANET or e-mail sightings to info@orcanetwork.org. 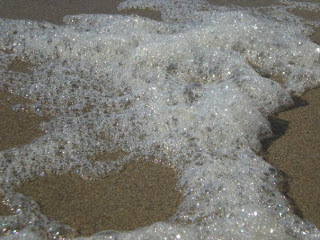 You can even receive updates on sightings via e-mail by signing up at http://www.orcanetwork.org/. Science Center. 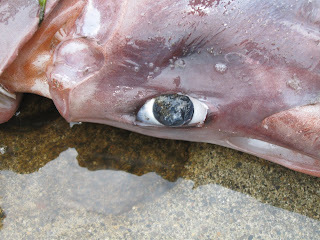 This morning we got a call fro m the office saying that a squid had washed up on the Adelma Beach on Discovery Bay. Since we were unsure of its size, we got suited up with gloves & boots and got lots of garbage bags! 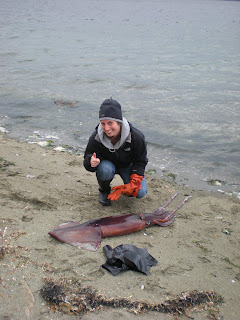 We were told it was a Humboldt squid which can get up to 7 feet long so Jess and I were prepared for a large one! 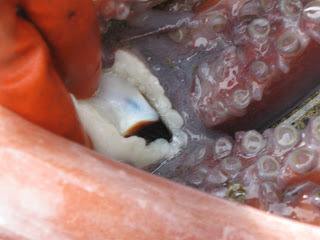 This one was pretty dense and roughly 5 feet from tentacles to the tip. 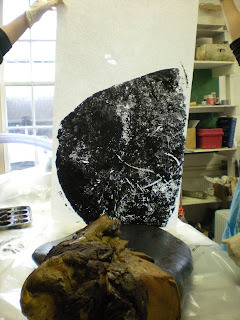 It is now being stored in our freezer for squid printing activities in the future! 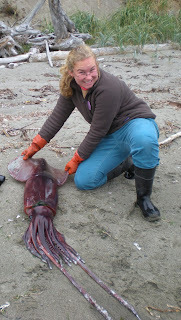 Since the beak of the humboldt squid is so hard (one of the stiffest organic materials in nature!) 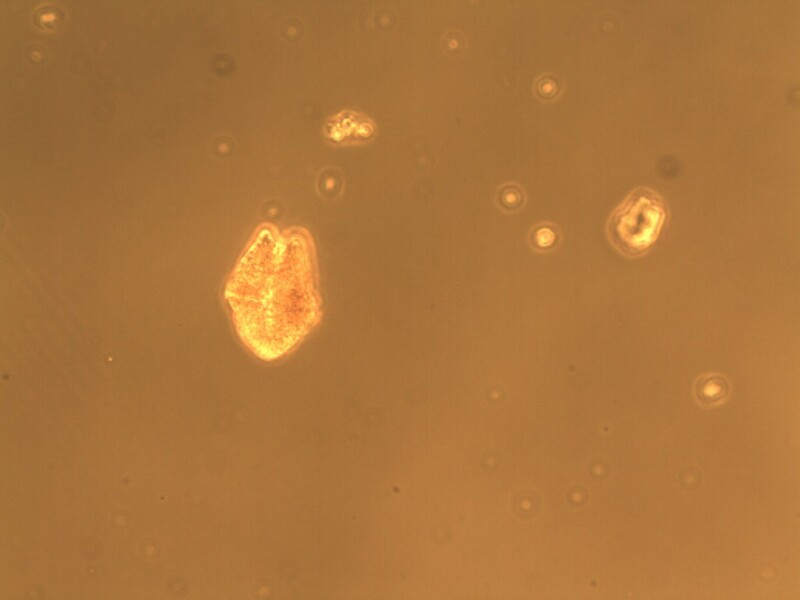 it was long a mystery how the delicate, gelatinous squids could operate their beaks without tearing their own flesh. "Here you have a 'cutting tool' that's extremely hard and stiff at its tip and is attached to a material ---- the muscular buccal mass ---- that has the consistency of Jell-o. You can imagine the problems you'd encounter if you attached a knife blade to a block of Jell-o and tried to use that blade for cutting. The blade would cut through the Jell-o at least as much as the targeted object." THE ANSWER TO THE MYSTERY! Researchers from UC Santa Barbara found that the beak's stiffness follows a gradient: the tip is extraordinarily stiff while the base is much softer, "100 times more compliant, allowing it to blend with the surrounding tissue". However, this gradient only exists when the beak is wet- once the whole surface becomes dessicated (dried out) it attains a uniform stiffness. Thank goodness squids are marine!! 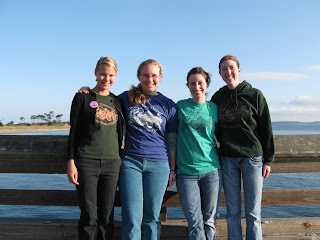 As the four new AmeriCorps members serving at the Marine Science Center, we though we'd send out our greetings to the PTMSC blogging world! We are thrilled to be beginning our 10 1/2 month tenure here! We began on October 1st and will be here until the end of August, 2010. It's been a whirlwind 12 days, packed with training, cleaning and new faces. I think I speak for all of us when I say that while I have a huge amount left to learn, not only am I excited to do so, but I know that the fantastic staff here will support and guide us along the way. We will all be posting to this blog a few times a month and you can follow us on Facebook and Twittter as well! Let us know if you have any questions or requests for blog posts. We'd love to hear from you. It was a normal beautiful Saturday morning at the marine science center and Jess, Julia, Jon and myself were busy cleaning tanks. 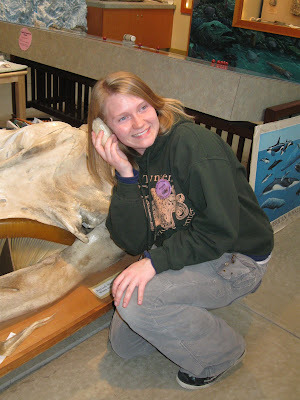 At about 10:30 Chrissy called us and told us that we may pick up some Killer Whales sounds on our hydrophones. So we turned up the hydrophone really loud and went back to work not very hopeful. Then suddenly we heard some whistles and pops! We all looked at each other and dropped our gloves and cleaning objects and ran out the door. There, in the distance 3-4 Killer Whales were swimming by! They had just turned around Point Wilson. After much screaming and excitement we ran inside and got binoculars and cameras! The pictures don't truly do these beautiful creatures justice but it is proof that we witnessed their passing through Admiralty Inlet. What a lucky boat huh? 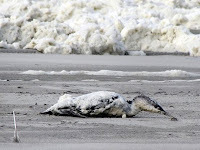 The same day the Wildlife Art Festival was happening and Killer Whales were heard and seen by many excited people. All day long people were coming into the marine exhibit and the natural history exhibit expressing their excitement about the Killer Whales. It was a very thrilling day for all of us! This afternoon while Jonathan, the Americorps and I were busy cleaning the Marine Exhibit, Cheqa ran in and asked us, "Do you guys want to see a big octopus?" So, of course, we all ran out excitedly to the dock. 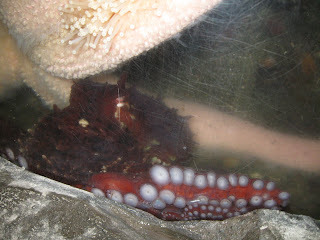 In one of his fish traps he had caught a big, 3-foot Giant Pacific Octopus! We put it in a bucket in hopes that Chrissy would let us keep her, at least for a little while. 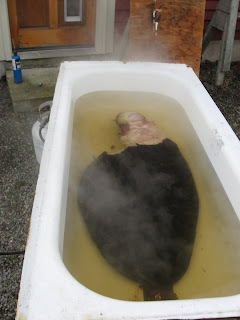 In this photo she is still hiding in her bucket after we got the round tank ready for her. Pinky was curious and went to go have a look at her new friend. 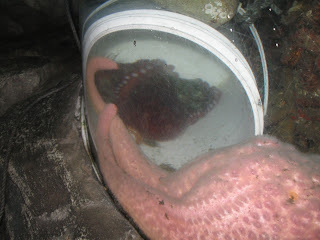 It took us a while to "octopus-proof" the round tank. We had to remove all the large fish and make sure she couldn't slip out the outflow tube. 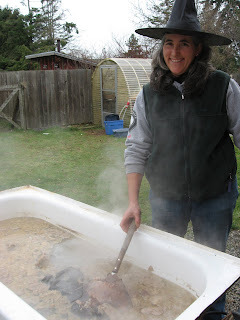 We fashioned a little mesh cap to put over the outflow tube so she couldn't get in there. Octopuses are extremely strong, so we had to put zip-ties around the mesh cap to make sure she couldn't pull it off! Here she is, sitting happily in her new tank. We determined that she is a girl, because we don't see any obvious signs on the hectocotyl tentacle, which is the third right tentacle. 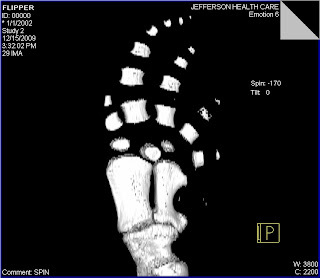 Males also have this arm shorter than the others. Now we have two octopuses to name! 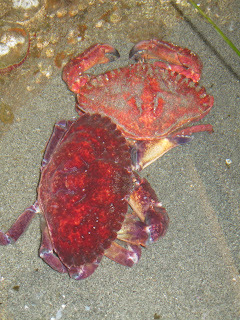 Be sure to come see her soon in the Marine Exhibit! 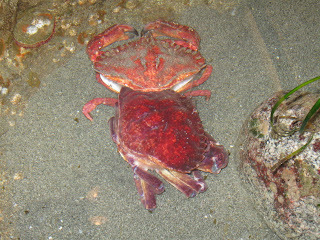 Yesterday during homecrew one of our volunteers Betty noticed a red rock crab was molting. 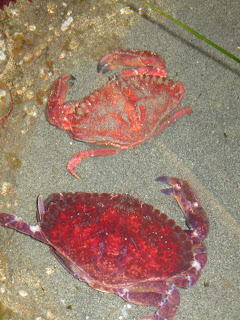 Molting is an amazing process that enables a crab to grow larger. 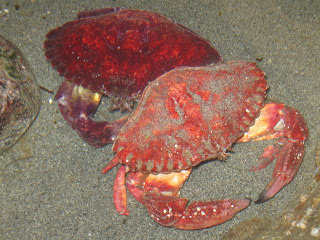 The molting crab leaves behind an exact copy of it's itself including the eyes gills and even the stomach lining. 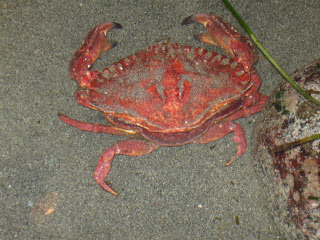 To molt the crab backs out through a split along the rear edge of its carapace (the large flat surface on it's back). 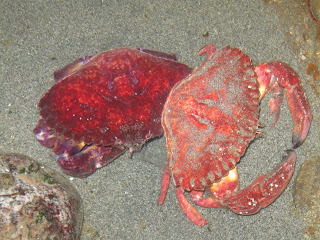 Once out of it's old 'shell' the crab's body is very soft and it puffs up with water increasing it's size. The split at the back of the carapace has just begun. 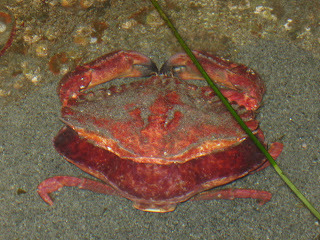 The crab now has its legs out. One claw has come out. It is finally free! The legs were so soft at this point, they were buckling under the weight of the body!